SuperPatriot approaches an abandoned warehouse where his children have been abducted as a means of drawing him out. He bursts into the building where Liberty & Justice are being held by an army of armored Nazi soldiers. These men are followers of Baron Blitzkrieg who orders them to shoot the hero, only for them to be slaughtered first. The survivors of this massacre flee for their lives, leaving their leader to face SuperPatriot by himself. Baron Blitzkrieg is defeated in quick fashion and his prisoners are soon liberated by their father. Justice is excited by this opportunity to “team up” with his father although SuperPatriot points out that this would hardly qualify as such a thing. The authorities arrive on the scene to round up the Nazis but they are unable to keep hold of Baron Blitzkrieg. He knocks the police officers aside before leaping into a river to swim away. Back in the 1940s, Johnny Armstrong is fighting alongside the rest of his platoon and is using his hand-to-hand skills to take out numerous Nazi soldiers. Their officer threatens to kill a number of American soldiers unless Armstrong surrenders. The young man leaps down to knock this officer unconscious before he surrenders to the enemy. SuperPatriot awakens early to begin his daily routine which includes walking down to the local newsstand to pick up a newspaper. He purchases the last copy of his preferred publication just moments before it could be bought by a woman named Claire Bono. She attempts to buy the paper from him but after learning that he is SuperPatriot, she gets excited. Claire ends up passing over her phone number and hints at wanting to meet up over dinner. 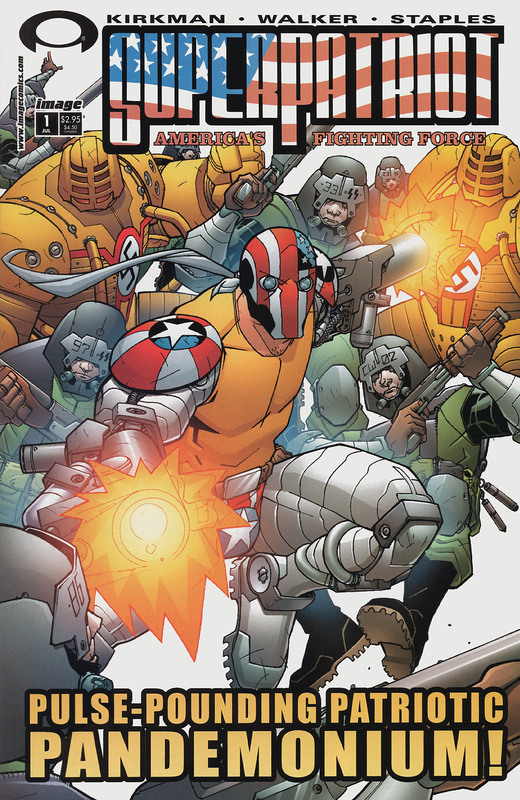 A bank robbery is foiled by SuperPatriot when the super-freak Roughneck attempts to steal money, his costume angering the hero due to it containing the red, white and blue. Dragon reaches the scene at the same time as the police and gets talking to his ally. He has only recently settled down in this reality after having made a decision to call this world his own. Dragon then offers an open invitation to SuperPatriot stop by his house if he is ever in the area. After mistaking Claire’s phone number for one of his kid’s, SuperPatriot accidentally contacts the woman and they end up going out on a date. Whilst in the middle of a conversation, SuperPatriot’s mind drifts away to the moment he gained powers. He had still been a prisoner of the Nazis who had been carrying out experiments upon their captives. Johnny Armstrong was their first success but he broke loose and attacked his former captors. As he awakens from this daydream, SuperPatriot shoots Claire’s head clean off before he realizes that he was still dreaming. He feels unsettled by this whole ordeal and excuses himself before leaving.